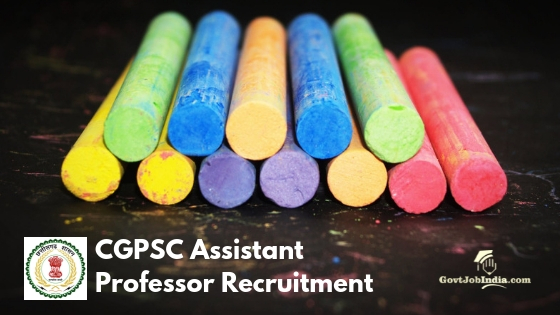 CGPSC Assistant Professor Recruitment: All the important details regarding CGPSC Assistant Professor Recruitment 2019 are mentioned below. Eligible applicants are requested to go through the article carefully. Also, bookmark the page so that no updates or latest notifications/advertisements are missed. The recruitment board has come up with a total 1384 seats for the post of Assistant Professor. Further, these seats are bifurcated into several subjects the candidates will be selected for. Please read all the details and apply accordingly for the subject interested. For more information on a number of seats allotted for each post please check the official advertisement. The Pdf includes all the points in detail. Details such as salary, age limit, education qualification are all mentioned below. Along with it, we have also provided a separate section that comprises steps on ” How to apply online”. Online applications for CGPSC Assistant Professor Recruitment 2019 will close on 5th March 2019. Online applications for CGPSC Assistant Professor Recruitment 2019 has already begun. The last date for online applications is set as 5th March 2019. Begin with filling the CGPSC application form 2019 to avoid last day traffic on the website. Follow the steps and keep checking this page to receive more updates. There are 2 more Pdfs related to the syllabus and online application. Both of these Pdfs can be found on the website. Go for the advertisement option and click on CGPSC Assistant Professor Recruitment. Candidates are requested to check the official advertisement Pdf for more details on Age Limit and Age Relaxation. Age limit and age relaxation differ in terms of various categories. They are all mentioned in the Pdf. The official Pdf is mentioned in the Hindi language. You can also download the same and check the details offline. CGPSC Education Qualification Post Graduate with minimum 50% or Grade B from a recognized board. The application fee is to be paid through credit/debit card/net banking or Challan. Please check the official Pdf for more details. Changes may or may not be applicable with the pay scale. The same will be updated to all the candidates. How to Apply for CGPSC Assistant Professor Recruitment Online? Candidates can apply online for CGPSC Assistant Professor Recruitment @ psc.cg.gov.in. On the homepage is an option for “Online Application”. Please register before you apply online and also read the annexure 3. It has all the steps and in-depth information on online application. Click on “Online Application” and search for Assistant Professor Application Form. Please ensure that you click on the right advertisement. Fill up all the details carefully and attach documents as required. Once done pay the online application fees as applicable. Submit application form and do not forget to take a print of the form. Let us know any of your questions or queries in the comment section below. Our team will surely get back to you with relevant responses. As of now we have not received tentative dates for admit card, and online examination. Many other details might also be missing because they are not yet announced. Please bookmark the page so you can get hold of them the moment they are declared. To know about more job opportunities with Government of India check our website @ govtjobindia.com. There are various opportunities based on locations, sectors, and academic qualifications. All the best!